Magna Carta - The Magna Carta is the ancestor of the US Constitution. Although not the first document in history to limit the king's power, it was the first initiated by his subjects guaranteeing their rights. 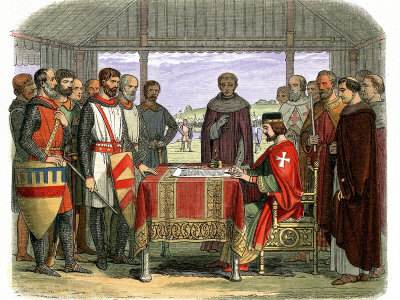 The forerunner of the Magna Carta (which is Latin for "Great Charter") was the Charter of Liberties, signed in 1100 by King Henry I. Henry was the youngest son of William the Conqueror, and took the throne when his brother, William II, was killed in a hunting "accident" (Henry was present on the hunting trip). Henry's older brother, Robert, was considered heir to the English throne, but he was away on the First Crusade; so Henry declared himself king. Many of the Saxon nobles would not recognize him as the new king, so Henry struck a deal with them. He drafted the Charter of Liberties (also called the "Coronation Charter") placing some limits on his power in exchange for their support of his rule. Subsequent monarchs pretty much ignored the charter, assuming it applied only to Henry. But when John became king, many of the nobles in his day were unhappy with his rule; although they figured there wasn't much they could do about it. It was the Archbishop of Canterbury, Stephen Langton, who dug up the Charter of Liberties and reminded them that they had guaranteed rights (apparently the archbishop was a learned historian). England's barons used this document as a precedent to compel King John to agree to a new charter as a means of limiting his power, and protecting their rights. So on June 15, 1215, on the banks of the River Thames near Windsor Castle in the presence of the English nobility, he signed the Magna Carta.